This was my very first time doing a Cara Box Exchange. I'm excited, yet nervous. What if my partner doesn't like the things I got her? What if I don't like the things that she got me? Well, there's more to it than that. You're making a new friend, you're giving them encourangement and you get some fun goodies in the process. It's such a fun program! 2// Make sure your box goes along with the theme. Get creative! Not everything has to be purchased. Get on Pinterest...find something awesome to make!! 3// Include 5+ items per box. Who wants to open a box with one item? Again, creativity! 4// Include a letter of encouragement. After getting to know the woman you are paired with and finding out about her life through her blog, make the effort to include a note of encouragement. This is not optional. It's great to get items that put a smile on your face, but kind words will last in your heart forever. 5// The last day of the month, create a blog post revealing your box and giving a shout out/link up to your match's blog. It's always nice to meet even more friends through the blogosphere. 7// You CAN participate even if you don't have a personal blog. At the end of the month you will type up your post and your partner can post it up jointly with theirs on their own blog. 8// I am in no way personally responsible for anything that occurs after I send you your swap partner. I also cannot be held accountable for lost or damaged packages. Tracking numbers are HIGHLY recommended & inexpensive. 9// If your partner ends up not participating or you feel slighted in some way, please let me know. There will be a one time warning & month probation for any of this behavior, before being completely banned from participating in future Cara Box Exchanges. My partner for this month is Nicole Flothe. 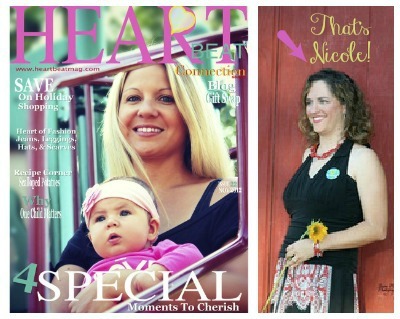 She's the managing editor for Heartbeat Magazine. We emailed to get to know each other & shop for our themed gifts! This month's theme was 'childhood' so we had to really think about what we'd want the other to have. We talked about all sorts of things like what our favorite childhood move was, favorite color, food & candy, hobbies we had. Then we take what we've learned & go shopping! I had so much fun shopping for Nicole! I took each item I purchased and wrapped them up in colorful paper & stickers and added them to the box. I even through in a few bonus items I thought she might like. I threw some rainbow heart confetti in there and mailed it out. I hope she likes it! I got my package from Nicole a few days later. Seriously, look at all those goodies! They came in that jewelry box in the right photo. I got a set of three glitter body art pens, some dress up magnets, a polka dot foldover bag, a gorgeous inspirational notebook, shimmery nail polish, a business card holder, a slinky, glitter crayons & a tiara! I totally scored! I love all my gifts! Nicole did an amazing job picking them out:) Thank you, Nicole! What a thoughtful box! So much fun -- I especially love the tiara! It really was fun! I truly loved everything in the box! This is so fun! :) Love the pretty crown. She did such a good job! Hooray for Cara boxes! I think I have that nail polish. haha. What a fun Cara Box!! That box the stuff came in is really cute. Body glitter pens too? That's so fun!! Great box. New follower from the swap. Cyber Monday @ PaperCoterie - 50% Off Sitewide! 40% All Recipe Products @ Paper Coterie! As Misc. as Misc. can be. "Gift Your Gift" @ Framed Frosting! 50% Off At Paper Coterie!